It was a grey autumnal day in Paris. 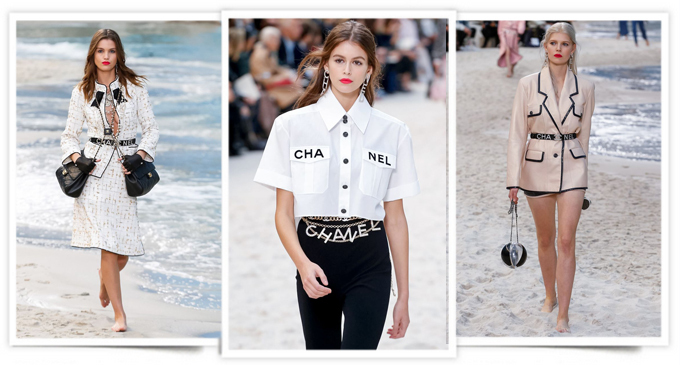 But at the Chanel show in the Grand Palais, Karl Lagerfeld ensured that summer stuck around for a bit longer. The designer, who previously brought a Chanel supermarket and a rocket bearing the brand’s signature double “C” logo to fashion week, doesn’t do things by half. This time, a beach was recreated that included an ocean with gentle waves, blue sky, wooden docks and lifeguards. To complete the scene, the former Baywatch actor Pamela Anderson watched the proceedings from the front row. This entry was posted in BREAKING MODE, PARIS FASHION WEEK 2019, pfw by admin. Bookmark the permalink.